Producer Boney Kapoor was on a travel schedule with wife Sridevi and daughter Khushi Kapoor. Sridevi, Boney Kapoor and their daughter Khushi Kapoor made a trendy appearance at the airport in Mumbai on February 18, 2018. The airport also saw the presence of producer Rhea Kapoor and brother Harshwardhan Kapoor. Boney Kapoor was seen in a blue track suit while Sridevi looked cool in an over-sized grey track suit with black glares. Daughter Khushi Kapoor was seen in a casual t-shirt and blue ripped denims with a pair of stylish glares. 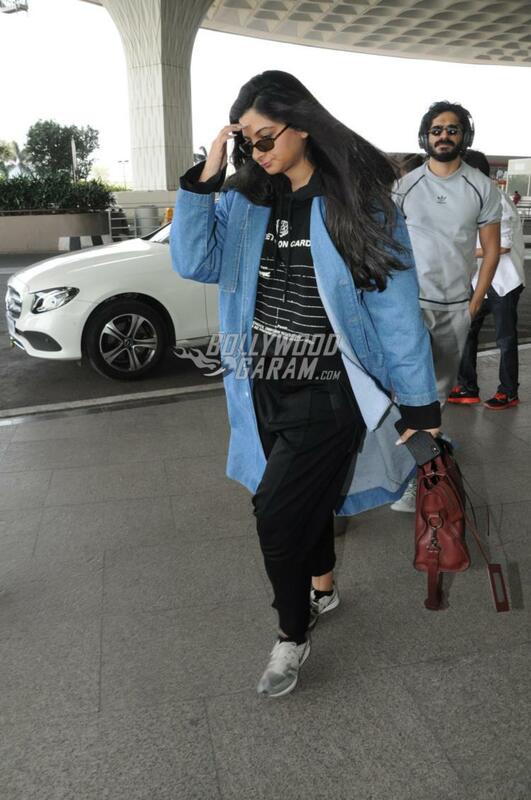 Producer Rhea Kapoor, who is busy with her upcoming production Veere Di Wedding, was also at her fashionable best in a black outfit and an over-sized denim jacket with grey shoes. Brother Harshwardhan was seen accompanying sister Rhea and looked cool in a grey t-shirt and matching track pants grey shoes with a heavy headphone. Harshwardhan will soon be seen in the upcoming biopic on the chess champion Abhinav Bindra. The film also stars his father Anil Kapoor. Next articleHichki title track Oye Hichki teaser unveiled!